In the yoof-speak of yore, ‘bad’ meant ‘good’, and still does, apparently. More recently, ‘sick’ also means ‘good’, while ‘well sick’ translates as ‘jolly good’. It’ll not be long before ‘paraneoplastic’ takes on positive connotations, although it’s doubtful today’s young tearaways could spell it. 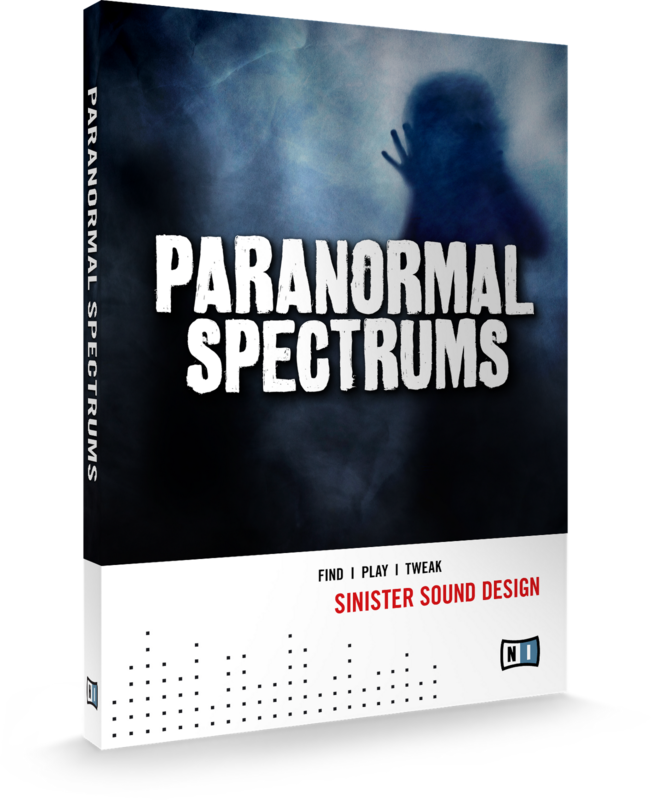 While Native Instruments may present with mild dyslexia, naming its reasonably recently released Komplete instrument as Paranormal Spectrums (Spectra, surely? ), the Deutsche developer certainly displays superior audio-assembling aptitude and could well push the bounds of English slang that little further. Thanks to the nature of the instrument’s creepy content, ‘ghastly, gruesome, macabre’ and more may come across to some as meaning ‘quintessentially delicious’ - we may even see the letter ‘g’ re-append itself to ‘chillin’. This Kore 2 instrument is sumptuously scary and, with Halloween approaching, now seems like the time to hide under the duvet, don headphones and audition the wicked thing (‘wicked’ meaning ‘spiffing’, in keeping with the terminological torture afflicted on language by tearaway teenage tossers). What NI and co-conspirator Cold Steel Music Audio Engineering have done is to concoct a 100-strong collection of sounds, each with eight distinct variations, making for 800 instant eerie instruments each of which can be further tweaked in Kore 2, freebie download Kore 2 Player or full-phat Kontakt 4-point-wherever it’s at right now. Spooky, nein? And rather cunning. The collection of real-world samples, augmented by synthesized elements, not only makes for other-worldly, maybe under-worldly, timbres, but offers immense control over how each of the basic sounds can be mangled into petrifying perfection for the project. And with such names as Nervous Breakdown, Screaming Beast, Crypt Of The Damned and Strange Lights In The Forest among the sound list, it becomes rapidly obvious just how dark is the forest into which we’re apprehensively ambling. Blair Witch Project, eat your heart out. 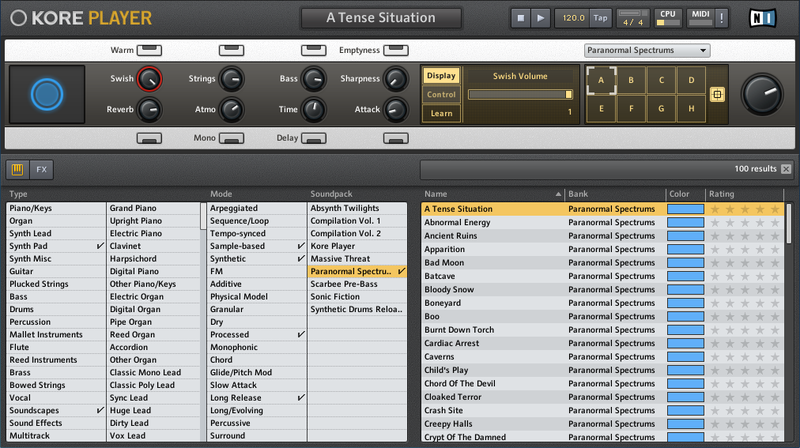 Actually, I wouldn’t have been surprised to see that last phrase as an entry in the basic sound list. 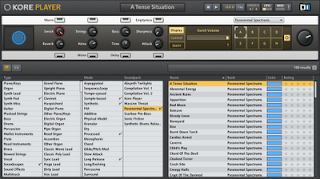 Some of the audio examples are aided and abetted by percussion patterns courtesy of Massive. There’s also the very occasional addition of Kontakt Strings, plus the odd boom from True Strike Tension, and just one is jollied along by Evolve Mutations 2. 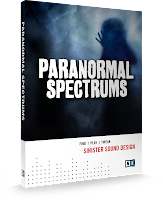 Everything else you hear is Paranormal Spectrums performing its atmospheric antics. This Komplete collection will not be everyone’s cup of hemlock. Muzos knocking up happy house, soft rock, reggaeton or the dreaded country and western are likely not to sup. But, videogame development and film soundtrackery aside, there are plenty of songwriting genres that would benefit from a dose of the doom-laden. We've scary soundscapes, morbid mallets, Hell’s bells and frightening flutes with which to bewitch, loosening listeners’ bowels by the bucketload. Not a pretty picture. But then Spectrums isn’t pretty, although I think it’s pretty awesome. NI didn’t get around to lending me a copy, so I actually forked out for it and do not as yet regret the €69 dent in my meagre budget. 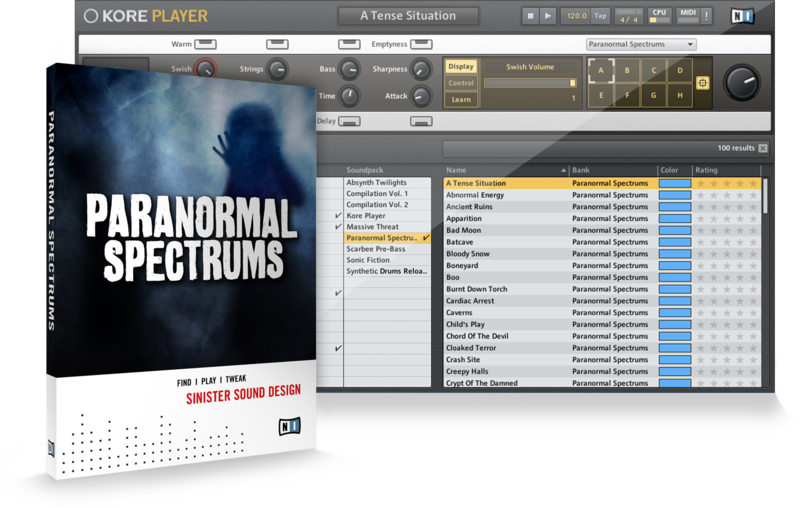 On a final, fiendish note, by cranking a Spectrums-based work up loud, I have the opportunity to unsettle trick-or-treaters when I open the front door to them on All Hallows’ Eve. So much more humane than injecting mustard into soft-centred chocolate treats, don’t you think?